Interpret the ECG shown in Figure-1 — obtained from a patient with new-onset chest pain. Localize the area(s) of acute infarction. Which coronary artery is likely to be acutely occluded? Figure-1: ECG obtained from a patient with new-onset chest pain. Which coronary artery is likely to be acutely occluded? (Figure reproduced from ECG-2014-ePub). NOTE — Enlarge by clicking on Figures — Right-Click to open in a separate window (See text). Small q waves are seen in leads II,III,aVF; and V5,V6. Transition is normal (occurs between lead V2-to-V3) — albeit the R wave is a bit taller-than-is-usually-expected in leads V2,V3. There is subtle-but-real ST elevation in each of the inferior leads (II,III,aVF) — with suggestion of hyperacute T waves (especially in lead II). A similar pattern of slight J-point ST elevation is seen in leads V5,V6 — with suggestion of hyperacute T waves in these leads. There is marked ST depression in leads V1-thru-V4. Impression: Sinus rhythm with acute infero-postero-lateral STEMI (ST Elevation Myocardial Infarction). The cath lab should be activated. We suspect acute LCx (Left Circumflex Artery) occlusion. Although q waves in the infero-lateral leads are small and narrow — these are the very same leads that manifest ST elevation with hyperacute T waves. While these might possibly be normal septal q waves — it is far more likely that they reflect ongoing acute infarction. In any case — We should know the answer shortly (if the q waves become larger as the infarct evolves – or – if they resolve after reperfusion). The ECG picture in leads V1,V2,V3 strongly suggests associated acute posterior infarction. We say this despite the reality that none of the standard 12 leads directly visualize the posterior wall of the LV (Left Ventricle). Therefore — to diagnose acute posterior MI, one either has to: i) Obtain additional leads that directly visualize the posterior wall (= leads V7,V8,V9); or ii) Perform a “Mirror” Test (turning the tracing over and holding it up to the light — which provides a mirror-image view of the anterior leads — Figure-2). Figure-2: Diagnosis of acute posterior MI is made from Figure-1 by applying the “Mirror” Test (ie, turning the tracing over and holding it up to the light). Doing so transforms the anterior ST depression and tall R waves that were seen in leads V2,V3 of Figure-1 into Q waves and ST elevation once the tracing is flipped over (red rectangle encircles leads V1,V2,V3 that were flipped over). The most common cause of acute MI is sudden total occlusion of a major coronary artery. The area of the heart affected will depend on distribution to the area from the coronary circulation. Prompt recognition of acute coronary occlusion with rapid initiation of reperfusion therapy is essential for optimal outcome. For this — evaluation of the initial ECG is invaluable. Appreciation of normal coronary anatomy and common variants facilitates the process. In Figure-3 — We present a schematic overview of normal coronary anatomy (Panel A). The two major vessels supplying the heart are the right and left coronary arteries. These most commonly arise from the right and left aortic sinuses, respectively. In most patients (80-90%) — the RCA (Right Coronary Artery) is a dominant vessel that supplies the RV (Right Ventricle) — and then continues as the PDA (Posterior Descending Artery) along the undersurface of the heart (unlabeled dotted vessel arising from the RCA in Panel A) to supply the inferior and posterior walls of the LV (Left Ventricle). Not shown — the AV nodal artery is most often supplied from the RCA. As suggested in Panel A — the LMain (Left Main Coronary Artery) is typically a short vessel (<10mm) that then bifurcates into the LAD (Left Anterior Descending Artery) and the LCx (Left Circumflex Coronary Artery). In ~15% of patients — there is a “left-dominant” circulation (shown in Panel B of Figure-3). In this case — the RCA is a smaller vessel than depicted in Panel A. To compensate — the LCx is typically larger and gives rise to the PDA (large unlabeled dotted vessel arising from the LCx in Panel B). In a left-dominant circulation — the inferior and/or posterior wall of the LV is supplied by the LCx. KEY Clinical Point: The existence of a left-dominant circulation in ~15% of patients explains why inferior and posterior MIs will not always be due to acute RCA occlusion. Similarly, since the AV nodal artery may be supplied by the LCx in a left-dominant circulation — AV block may also occasionally occur with LCx (rather than RCA) occlusion. Figure-3: Overview of normal coronary anatomy. Panel A — the most common situation (80-90%), in which the RCA is a dominant vessel that supplies the RV as well as the posterior and inferior walls of the LV. Panel B — represents a left-dominant circulation, in which the LCx (rather than the RCA) supplies the posterior and inferior walls of the left ventricle (Figure reproduced from ECG-2014-ePub). While definitive identification of the “culprit” artery (acutely occluded vessel) will be forthcoming on cardiac catheterization — assessment of the initial ECG may provide important clues to the angiographer that facilitate knowing where to look. Given the presence of acute inferior infarction without anterior ST elevation in Figure-1 — the “culprit” artery is almost certainly either the RCA (Right Coronary Artery) or the LCx (Left Circumflex Coronary Artery). ECG findings arising from acute RCA occlusion will vary depending on: i) Whether the patient has a dominant right or left circulation; ii) The relative site of occlusion within the RCA (ie, proximal or more distal occlusion); iii) Any prior infarctions that may have occurred; and iv) The status of the collateral circulation. For simplicity — We describe expected ECG findings assuming no prior infarctions and no alteration in collateral circulation. In the 80-90% of patients with a right-dominant circulation (Panel A in Figure-3) — the most typical manifestation of acute RCA occlusion is ST elevation in all 3 inferior leads (II,III,aVF) = acute inferior MI. Acute RV (Right Ventricular) MI — is likely to be seen when there is proximal RCA occlusion. More distal RCA occlusion may spare much of the right ventricle. PEARL: Proximal RCA occlusion is suggested when ST elevation in lead III is more than in lead II (especially if there is marked ST depression in lead aVL). This picture is seen in Figure-4. In contrast — a left-dominant LCx occlusion is suspected when there is inferior MI with less ST elevation in lead III and less ST depression in lead aVL (especially if there is significant ST elevation in leads V5,V6). Posterior MI — is commonly seen with RCA occlusion (because the RCA most often supplies both inferior and posterior walls of the LV). Posterior MI may also be seen with LCx occlusion IF there is a left-dominant circulation. In either case — there will usually be ECG evidence of inferior MI when there is posterior MI. Figure-4: Acute infero-postero MI from acute proximal RCA occlusion. Note ST elevation in lead III > II with marked reciprocal ST depression in lead aVL. Posterior involvement is suggested by the ST depression in lead V2 (positive “mirror” test). 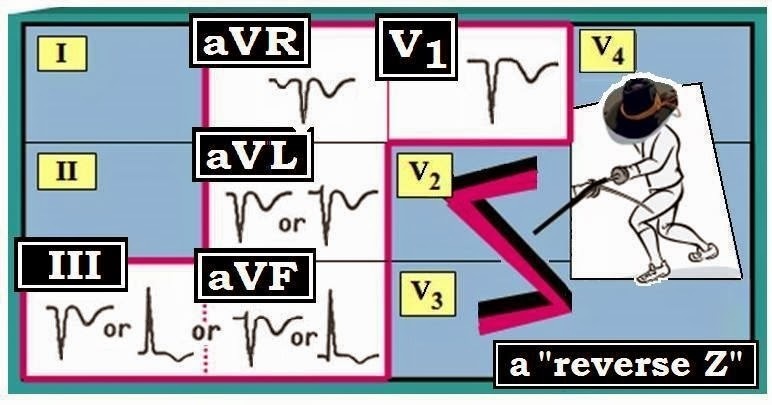 There may also be acute RV involvement (Figure reproduced from ECG-2014-ePub). Lead III is more rightward (at +120 degrees) than lead II (at +60 degrees). As a result — acute occlusion of the RCA generally produces more ST elevation in lead III than in lead II (Figure-4). The electrical perspective of lead aVL is virtually opposite that of lead III. As a result — the shape of the reciprocal ST depression in Lead aVL often looks like the mirror-image of the ST elevation in lead III. ST-T wave changes in aVL are typically marked when there is proximal RCA occlusion — and are generally more prominent than in lead I.
Posterior MI is suggested in Figure-4 — because of the positive “Mirror Test” for lead V2 (ie, flipping lead V2 over would result in a Q wave with slight-but-real hyperacute ST elevation in this lead). NOTE: Associated posterior MI may be seen when acute inferior MI results from either RCA occlusion or a left-dominant LCx occlusion. However, associated acute RV (Right Ventricular) MI localizes the “culprit artery” to the RCA — because the right ventricle is not supplied by the LCx (Left Circumflex Artery). While use of right-sided leads is needed for definitive diagnosis of acute RV MI — a hint that RV MI may be present is sometimes provided by right-sided lead V1 — IF there is ST coving or slight elevation in lead V1 but ST depression by lead V2. Beyond-the-Core: We suspect that there may also be associated acute RV MI in Figure-4 — because the ST-T wave in lead V1 is relatively flat. Normally, with acute posterior MI — there is similar-appearing ST-T wave depression in each of the anterior leads (V1,V2,V3). In contrast, when there is also acute RV MI — right-sided ST elevation in lead V1 cancels out some of the ST depression that would have been seen from the posterior infarction. Bottom Line: Suspect associated acute RV MI with acute infero-postero MI from proximal RCA occlusion — IF you see ST segment coving with slight ST elevation in lead V1. The finding of a flat (instead of depressed) ST segment in lead V1 (as is seen in Figure-4) — suggests that there may be some canceling out of V1 ST depression by acute RV ST elevation. IF important to know — right-sided leads would answer this question. Clinical Note: It is well to remember that 2nd-degree AV Block, Mobitz Type I — is most often seen in association with acute RCA occlusion (since the RCA usually supplies the AV nodal artery). That said — Mobitz I may occasionally be seen with acute LCx occlusion of a left-dominant circulation (in which case the AV nodal artery will usually be supplied by the Lcx). There is acute infero-postero-lateral MI. The “culprit” artery is likely to be a dominant-left Circumflex (LCx) because: i) ST elevation in lead III is less than in lead II; ii) There is no ST elevation in lead aVL; iii) There is no hint of acute RV involvement (ST depression is prominent in V1 — whereas we’d expect either a flat or coved ST segment with slight elevation in V1 if there was associated RV involvement); and iv) There is ST elevation in V5,V6 — and this ST elevation in lead V6 is clearly more than it is in lead III. Figure-5: ECG obtained from a patient with new-onset chest pain (this ECG was initially shown in Figure-1) There is acute infero-postero-lateral MI. The “culprit” artery is most likely to be the LCx in a dominant-left circulation (See text). Link to Section 10.0 — for pdf download on the ECG Diagnosis of Acute MI (from our ECG-2014-ePub). On a lighter note — I thought I would share the short poem I just wrote regarding rhythm interpretation. I was inspired by those who negate the use of lead II as "giving no clue". If you only use one you are slacking. It helps with the answer, while before you had none. Because if not — then a shock you must enable. Will allow you your rhythm skills to best hone! You are told that the limb lead sequence shown in Figure-1 was obtained from a middle-aged adult. You note a Q wave and symmetric T wave inversion in lead III. Has this patient had an inferior infarction? Is T wave appearance in these 6 limb leads suggestive of ischemia? Figure-1: Limb lead sequence from a middle-aged adult. Is lead III appearance suggestive of ischemia/infarction? (Figure reproduced from ECG-2014-ePub). NOTE — Enlarge by clicking on Figures — Right-Click to open in a separate window (See text). A Q wave is seen in lead III of Figure-1. Technically — this is a QS complex, since there is no R wave. Although this Q wave is not particularly deep (it is only 2mm) — given lack of any R wave, this Q wave (QS complex) portends the same clinical implications as would a larger or wider Q wave. That said — Q waves are not seen in the other 2 inferior leads (leads II,aVF). There is fairly deep symmetric T wave inversion in lead III (especially in view of the small amplitude for the QRS complex in this lead). IF this finding was noted in a patient with new-onset chest discomfort — We would clearly be concerned about acute ischemia. That said — there is no more than nonspecific ST-T wave flattening in lead aVF and no ST-T wave abnormality in the other inferior lead (= lead II ). Clinical Note: The T wave vector often follows fairly close behind the QRS vector. As a result — isolated T wave inversion that often occurs in leads III, aVL or aVF is clearly less likely to be ischemic IF the QRS complex is also predominantly negative in the lead that manifests T wave inversion. This is the case for lead III in Figure-1. Impression: We would note the following on our interpretation: “Q wave with T inversion in lead III; nonspecific ST-T wave flattening in aVF; Suggest clinical correlation”. That said — All bets would be off IF this patient had new-onset chest discomfort, since absence of abnormality in lead II does not exclude the possibility of acute ischemia/infarction. But IF this patient was asymptomatic (especially if a prior tracing was available and showed similar findings) — We would strongly suspect that the ECG appearance in lead III of Figure-1 was not indicative of ischemia/infarction. “Take-Home” Point: Most of the time when Q waves/T inversion reflects ischemia or infarction — neighboring leads will show similar changes. Among the most challenging tasks for the ECG interpreter — is deciding what is “normal” vs “abnormal”. Our purpose in devising Figure-2 — is to facilitate remembering when the finding of even a large Q wave or deep T wave inversion may be normal. 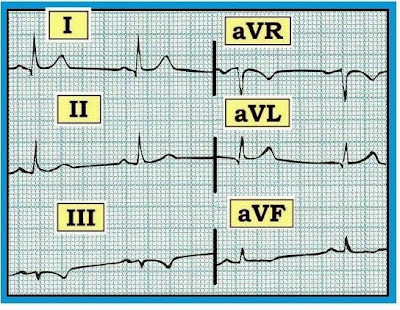 5 of the leads on a standard 12-lead ECG (= leads III-aVR-aVL-aVF-V1) — may normally display even moderate-to-large Q waves and/or T wave inversion in healthy adults who do not have heart disease. Thinking of a “reverse Z” (à la Zorro) — may help to recall which leads these are (Figure-2). Figure-2: Leads that may normally manifest T wave inversion or Q waves. Recall of these leads is facilitated by thinking of a reverse “Z”. (Figure reproduced from ECG-2014-ePub). KEY Points: Traditionally — the finding of a deep and wide Q wave is thought to be a marker of myocardial infarction. Other pathologic reasons for Q waves exist — including cardiomyopathy (scarring/fibrosis); conduction defects and WPW. It is well to be aware of instances when Q waves (and associated T wave inversion) may be a normal finding. Normal septal q waves — are common. Septal q waves are small and narrow. They arise because the first part of the ventricles to normally depolarize is the left side of the septum. As a result — left-sided leads see the initial depolarization vector as moving away from the left as the septum depolarizes from left-to-right. This accounts for the normal small q wave that may commonly be seen in one or more of the lateral leads (= leads I-aVL-V4-V5-V6) in asymptomatic individuals without heart disease. The reason we do not include normal septal q waves in Figure-2 is because their small and narrow dimensions makes it obvious that such q waves are unlikely to be pathologic. Lead aVR — is normally all negative (negative P wave, QRS and T wave — as seen in Figure-2). Global negativity for lead aVR is logical given the remote right-sided location of this unipolar lead (the depolarization vector continually moves away from right-sided lead aVR under normal circumstances). Lead V1 in adults — typically shows a QS or rS complex and T wave inversion (Figure-2). A QS complex may normally still be seen in lead V2 without this necessarily meaning there has been prior septal infarction. However, by lead V3 — at least some r wave should be seen under normal circumstances. Regarding T wave appearance in lead V1 — the T should normally be upright by lead V2 in adults. Persistent T wave inversion in anterior leads should prompt consideration of ischemia. NOTE: The situation is different in children — for whom anterior T wave inversion up to lead V3 (or even V4) may reflect a normal juvenile T wave pattern. Leads III, aVL, aVF (as in Figure-2) — may all normally show T wave inversion and/or an isolated Q wave that is not the result of ischemia or infarction — provided that these findings are not also seen in neighboring leads. Applying Figure-2: Returning to Figure-1 — We see an isolated Q wave and T inversion in lead III. This may be a normal finding — especially IF: i) it is isolated to this single inferior lead (as it is in Figure-1); ii) the QRS complex in lead III is predominantly negative in the lead which shows T inversion; and iii) the patient is not having new-onset chest pain. CLICK HERE — to download a pdf of Section 09.0 on ST-T Wave Changes (excerpted from ECG-2014-ePub). Please check out my Comment 1183 on the ECG Guru for additional illustration of how isolated findings in one of the above limb leads is generally "benign".